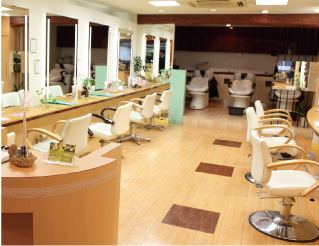 TOMY'S Inc runs 23 beauty salons, principally in Tokyo's Setagaya Ward. The salons feature any of three concepts: Desire, Imajine, and entrir. Based on the concept of comfort and offering style ideas that shine with good taste, entrir Kichijoji is a beauty salon hugely popular among its adoring fans, who span a broad range of generations. 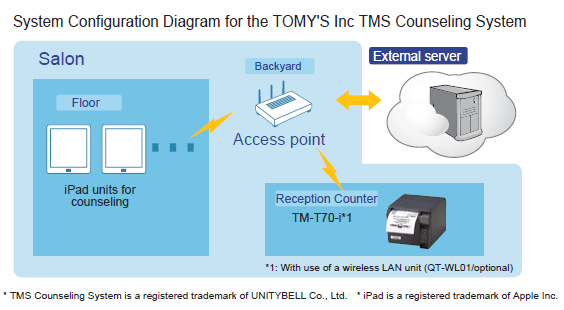 TOMY'S Inc and UNITYBELL worked together to develop the TMS Counseling System. This is a stylish counseling system via iPad that offers everything from counseling to hairstyle ideas. There is a TM-T70-i installed at the reception counter that prints out for customers a slip confirming information such as the treatment decided on, cost, and time. This facilitates the elimination of any gap in understanding between the customer and stylist. TOMY'S Inc apparently wants to go beyond the visible needs of customers to tease out the wants that are not in immediate view. They focus on pre-treatment counseling in order to provide the ultimate beauty that is sought by customers. At the same time, as counseling is to a large degree made possible by stylists' long years of experience, TOMY'S Inc had faced with the challenge of raising the bar on standardizing counseling skills, as well as making it possible to acquire such skills over the short term. The TMS Counseling System that was co-developed with UNITYBELL was installed as a solution to this challenge. The iPad is utilized to have customers answer questions by the Wizard format. This makes it possible for even less experienced stylists to understand customers' wants. Meanwhile, the iPad displays images of the latest hairstyles, thus enabling stylists to provide the kind of spot-on suggestions that customers find pleasing. The system facilitates the process of rapid development of the stylist because it enables the frontloading of on-site experience. The confirmation slip for the customer is printed out quickly and neatly by the TM-T70-i, a process that in comparison to the traditional handwriting is far quicker and free of omissions. As customer and stylist both have prior visual access to the particular treatment, there is also less likelihood of a gap between the actual outcome and what the customer had expected. entrir Kichijoji salon manager Chiharu Ogawa explains that installation of the system has paid off the expected dividends. "The hardest part of this job is pinpointing exactly what the customer wants as based on conversation. By installing the TMS Counseling System, even less experienced staff are able to identify the wants of customers. Counseling by iPad has made the process as fun as fortune-telling for regular customers. And they have the impression that they are being engaged in a more courteous manner than before. By increasing customer satisfaction, we have also seen a commensurate increase in the average amount spent by customers. It will be nice if even more extensive use of this system makes for an increase in the pretty women." "The printer is wireless and small, so it does not get in the way even when placed on the reception counter. The details of the treatment that the customer and stylist decided on is immediately printed out on the reception counter printer nowhere near them, so that was a surprise to me. The way we see it, we are entrusted with three things by the customer: time, money, and expectations. This is why we get confirmation prior to the actual treatment. When customers see slip printed characters this neat and easy to make out, even the slip itself goes a long way in conveying the company's commitment to integrity." The Decisive Factor Was a Web Service Print Function that Can Print XML Data(ePOS-Print API/XML). Development time shortened using sample programs. We asked UNITYBELL president Masataka Sawara about this system. "The TMS Counseling System makes use of the iPad and a simple wizard format to provide counseling. It is a system that enables stylists to give ideas about and confirm what the ideal hairstyle might be for customers. Our partner in the development of this system was beauty salon management company TOMY'S Inc and the system itself is loaded with their know-how and wealth of content. That's why it is a system that helps beauty salons standardize counseling skills, better prepare staff for on-site work, and enhance both customer satisfaction and the amount spent by customers. The key factor in deciding on the TM-T70-i was the availability of a web service print function that can print XML data(ePOS-Print API/XML). Among the receipt printers that print direct from smart devices in a cloud computing environment, we found that there was no better product than the TM-T70-i. And due to the compact design and its ability to run on a wireless LAN, it can be placed anywhere. It also prints characters and lines neatly. This seemed to be the perfect choice for beauty salons, as their customers are exacting when it comes to aesthetics. In developing it, there were varieties of documents easy to understand, so we were able to develop with assurance, without having to even make inquiries. It is particularly easy to use for sample programs, so we were able to create the system in a short period of time. We hope to link the counseling system to POS in order to further develop the system to be of even greater use to beauty salons.